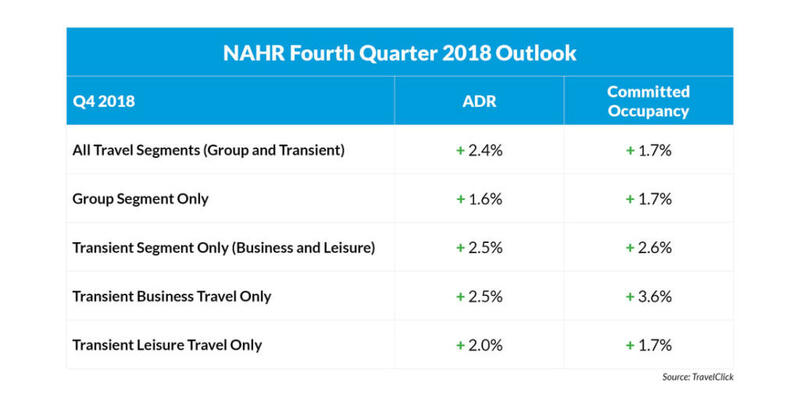 NEW YORK—The third quarter for North American hoteliers is, once again, stable growth across all travel segments, up 2.2% in average daily rates (ADR), 2.4% in bookings and 4.7% in RevPAR, according to TravelClick’s North American Hospitality Review (NAHR). This data continues the positive trend across the industry from the first half of the year. In particular, transient business travel is experiencing noteworthy year-over-year upticks in ADR, bookings and RevPAR, up 3.1%, 6.1% and 9.4%, respectively in Q3 2018. Additionally, the transient segment overall—business and leisure—is up 2.6% in ADR, 2.5% in bookings and 5.1% in RevPAR. For the next 12 months (July 2018 – June 2019), transient bookings are up 2.6% year-over-year, and ADR for this segment is also up 2.6%. When broken down further, the transient leisure (discount, qualified and wholesale) segment is slightly up 0.5% in bookings, and ADR is up 2%. 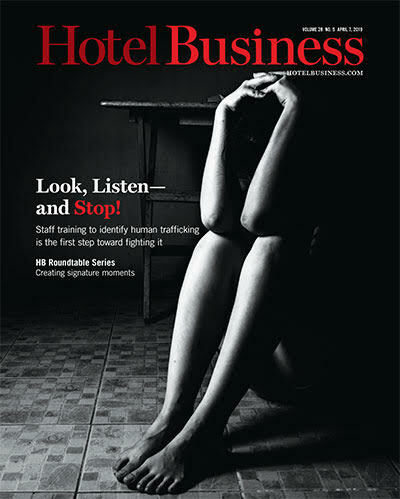 Additionally, the transient business—negotiated and retail—segment is up 5.9% in bookings and 3% in ADR. Lastly, group bookings are flat at 0% percent in committed room nights* over the same time last year, and ADR is up 1.3%. 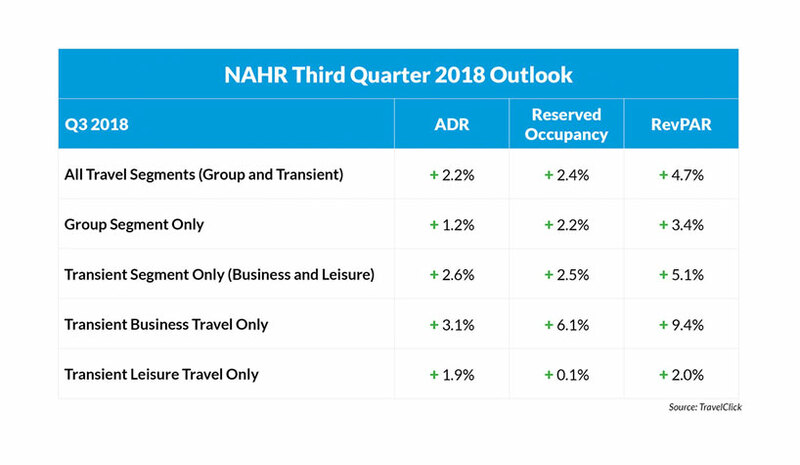 The July NAHR looks at group sales commitments and individual reservations in the 25 major North American markets for hotel stays that are booked by July 1, 2018, from the period of July 2018 – June 2019. The third quarter combines forward-looking data (July – September).